Metal Flowers are a collectible in Horizon Zero Dawn. Once you collect ten Metal Flowers of a certain set, you can buy the reward box from Kudiv in Meridian. He is a Flower Collectibles Specialty Merchant found in northern Meridian. The three boxes he sells are for the three sets of Metal Flowers. Find and grab ten of the same set to get one reward box.In this guide, we’ll show you where to find Metal Flowers in Horizon Zero Dawn, and the Kudiv’s Reward Box content. Collecting one Metal flower you’ll get the First Metal Flower Found trophy, while collecting all you get the All Metal Flowers Found trophy. Note: The Metal Flower Locations are easily spotted from the distance by the shape of the larger flowery triangle around the center of the collectible. Once you find the first one, keep looking for the same shape for the rest of them. Set I Metal Flowers are found in the starting area, just before you reach the desert. The first one is inside the cave. The same one you fall down in while you play as little Aloy, east from Mother’s Watch. Once you grow up, go back there. It is in the southern part of the map, within the area marked as the Ruins. Head to the southwestern part of the ruins, break the stalagmite blocking the entrance of the room. Destroy the entrance to get in. From your and Rost’s house, go west. You’ll need to walk over two ropes to get there. After you leave the starting zone, there is a small passage that leads to a new one, north from Mother’s Rise. If you follow the road from here, you can spot the burned houses to your left. Go behind them, up the hill. In the second zone, to the northeast, above the excavation camp, east from Devil’s Thirst – Bandit Camp. In the northeastern part of the global map, within the green grassy area, you’ll find many ruins. The Metal Flower at this location is close to the first tall ruins you encounter. Just like the first one, this one is also inside the underground cave. It is within the same area where you can get the best armor in the game – UltraWeave Armor. You’ll find the cave’s entrance east from Mother’s Heart settlement. Jump into the cave and keep to your left. To your left, in the cave. East from the fifth one, within the same grassy ruins area, close to the ponds and water. In the northeastern part of the global map, east from the Banuk Encampment, deep into the snowy area, on the path of the main mission “The Grave – Hoard”, just before the bonfire, on the ground. North from Mother’s Heart, south from Hunter’s Gathering, east of the large lake. West from the previous flower location, you come across the waterfall. Follow it upstream until you notice dead dried-out tree. Kudiv’s Reward Box I might contain different prizes from player to player. The main ones are 1 000 Metal Shards, two very rare modifications and five green modification boxes. The modifications we got are: 43% and 44% Shock Coil, 31% Resist Freeze Weave (very rare), 26% Corruption Coil (rare), 6% Damage Coil, 2x 6% Resist ranged attacks Weave. The second set of Metal Flowers is scattered around the northwestern part of the world map. Once you enter the desert area, head north to the southeast of Free Heap. Find a narrow path, between rock plateaus, close to one tree. Before you cross the gate that takes you to the desert area, you can spot the lake with a couple of Snapmaws. Look on a tiny island, next to the tall tree. At the far western side of the U-turn river bank, next to the crossroad, north from Lone Light. Northwest on the global map, northeast from Sunfall. Follow the mountain edge, and climb its lower peak. In the northeast of the desert, west from the Free Heap settlement, within the plateau surrounded with two larger snowy hills. Get close to the northern pond, and watch out for level 27 Thunderjaws. In the northern part of the global map, there is a settlement called Pitchcliff. Following the road south from it, cross the river and climb on the hill east of the nearby corrupted zone. There is a small path on the eastern side of the hill. Use it to reach the top and the Metal Flower. 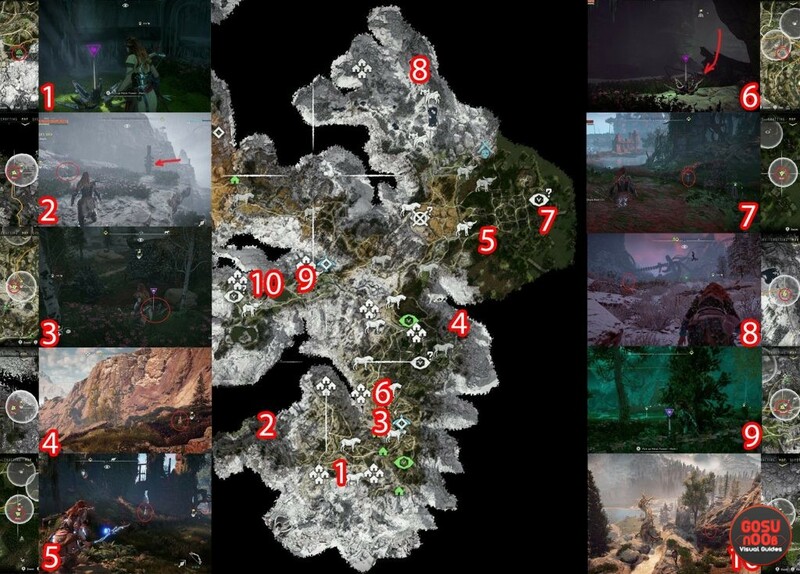 In the northernmost part of the map, north from Pitchcliff, almost at the edge of the map, in the area guarded by a level 27 Stormbird, on a small rock boulder. Head to the westernmost part of the map, southwest from Sunfall. You’ll find it on the ground, next to two tall trees. At the edge of a huge plateau across the river, northeast from Brightmarket, where the path connects these two parts. You’ll have to follow the road from the north of this location to reach the place. The path takes you to the higher ground and the Metal Flower. There are several hostiles here, so watch out. At the southwestern part of the largest lake, there is a Snapmaw feeding ground. The collectible is on the shore next to them. Just like the first one, in Kudiv’s Reward Box II you can get 1 000 Metal Shards, and the modifications like: 44% Corruption Coil and 35% Freeze Coil (very rare) and five green Modifications boxes. 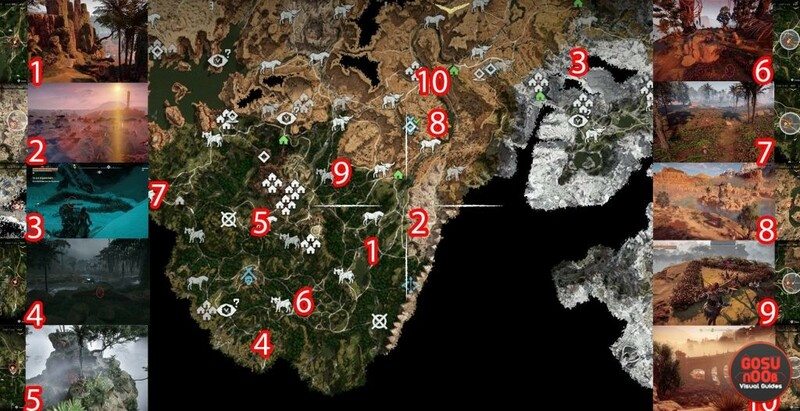 The final ten Metal Flower locations are all around Meridian, in western part of the global map. Southeast of Meridian and the Estate, next to the tall rock boulder. Northeast of the previous one, at the edge of the mountain plateau with strange shapes. In the eastern desert, north from the Two Teeth bandit camp, follow the path into the snowy mountain. Southwest on the global map, west from Cauldron XI, close to the improvised river bridge with wooden pillars. Southwest from Meridian Village, on top of the tall thin mountain. You have to climb on top of it, from its southern side. There is even a vendor on top of it. Who knows how she got there with all that heavy weight. Climb up the mountain here. Location of the Metal Flower. South from the Estate, west from the first bonfire, on top of the tall thin mountain. You have to climb it from its eastern side. West from Meridian, at the crossroad, between two bonfires. It is a bit hard to notice, since the foliage around it is the same color. Northeast from Meridian, southeast from Lone Light, at the western side of the lake with two islands in it. 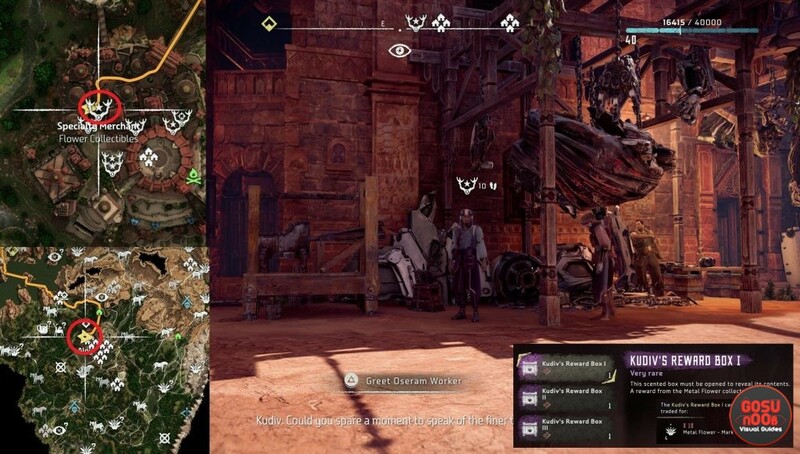 It is in the Tallneck patrol area. East of Meridian, follow the path that takes you to top of the mountain, where a part of the main mission “Honor the Fallen” takes place. You’ll need to walk over the rope to get to the Metal Flower. Under the bridge, southeast from the Lone Light settlement. Kudiv’s Reward Box III prizes: 1 000 Metal Shards, 2x 43% Fire Coil and five green Modification boxes.